Due to space limitations we only accepted 100 participants - we hope at least one person from each SI2 project will be able to attend. Please register. The style of this workshop was a hybrid between a traditional top-down driven agenda and a contemporary participant-driven agenda. Participants chose topics on-the-fly for the breakout sessions. See the forum and agenda for details. Participants are expected to share a digital and paper poster. The 2015 NSF Software Infrastructure for Sustained Innovation (SI2) Principal Investigator (PI) workshop was held on February 17-18, 2015 at The Westin Arlington Gateway, Arlington, VA.
Software is an integral enabler of computation, experiment, theory and a primary modality for realizing NSF’s Cyberinfrastructure Framework for 21st Century Science and Engineering (CIF21) vision. Within this vision, the SI2 program has the overarching goal of transforming innovations in research and education into sustained software resources that are an integral part of the cyberinfrastructure. 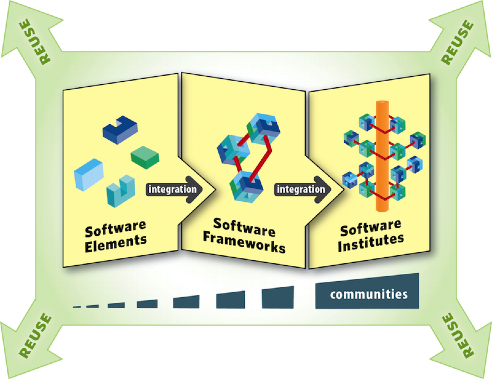 SI2 is a cross-foundation program, which generates and nurtures the interdisciplinary processes required to support the entire software lifecycle; promoting the successful integration of software development and support with innovation and research. SI2 currently supports vibrant partnerships among academia, government laboratories and industry for the development and stewardship of a sustainable software infrastructure that can enhance productivity and accelerate innovation in science and engineering. • Serve as a focused forum for PIs to share technical information. • Explore innovative topics emerging within software communities. • Discuss emerging best practices across the software projects. • Stimulate thinking on new ways of achieving software sustainability. • Gather the shared experiences in an online web portal. Achieving these five objectives will expand the collective domain of knowledge on software infrastructure, enhance the capability for sustained innovation within software communities, and contribute to the broader CIF21 vision. Click the links for the 2013 SI2 PI workshop and the 2014 SI2 PI workshop.